The beautiful Seychelles Islands are a classic honeymoon destination with some truly luxurious and wonderful places to stay (and happily devoid of huge resort hotels), but there are some fabulous family destinations too. The Seychelles conjure up visions of warm turquoise seas with waves breaking on white coral sands shaded by palm trees – a tropical paradise where the pace of life is so leisurely. There are lots of activities taking full advantage of the wonderful natural surroundings that the Seychelles offer. Take a boat and go island hopping or on various excursions, there are a whole world of water-based activities, such as snorkelling, diving and fishing, there are kids’ clubs, guided walks, turtle nesting and botanical gardens, and you are sure to see one of the islands’ famous giant tortoises. The Seychelles attract a myriad of migrating seabirds. Ornithologists come to see tropicbirds, frigate birds, noddys, terns and shearwaters. Whilst Cousine and La Digue have rare endemic bird species such as the magpie robin can be spotted. Then there’s all that Creole culture and cuisine; Creole restaurants are numerous and seafood delicious. Each island has a different feel so why not take two or three weeks island hopping or combine it with African safari, they lie only 800 miles from the east coast of Africa. There are 115 granite islands and coral atolls, with a population of only 91,300. 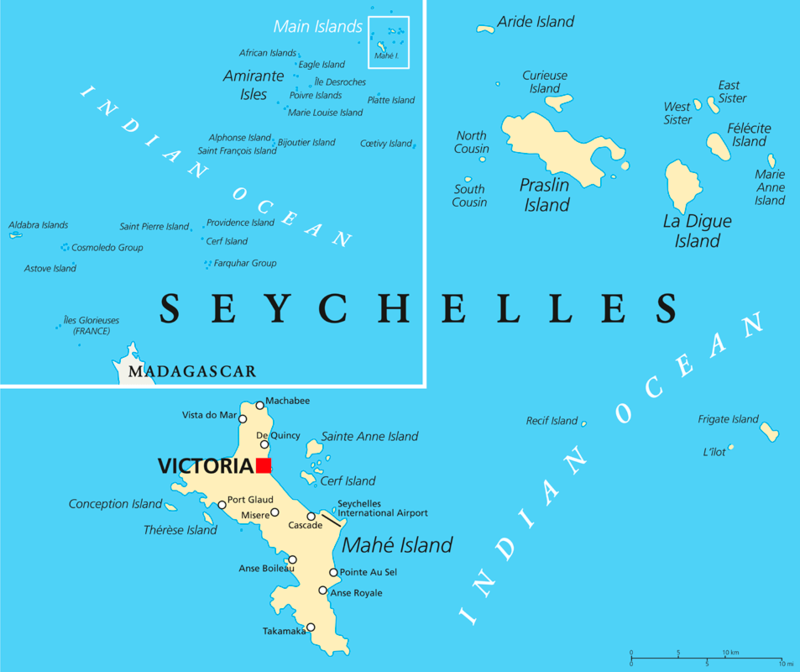 The islands are divided into two distinct groups – the tall granite, Inner Islands located mainly within the relatively shallow Seychelles’ plateau, just south of the Equator, and the low-lying coralline cays, atolls and reef islands of the Outer Islands that lie mainly beyond the plateau further south of the Equator. Mahe is the largest island, and home to the capital city of Victoria, where the international flights land. It is also the island where most of the accommodation and sites are to be seen. The second largest island of Vallee de Mai is a UNESCO World Heritage Site. You can find the exotic Coco der Mer (double coconut) on Praslin, an unbeatable island with superb diving, snorkelling, and sailing, and within reach of other islands including La Digue. La Digue has beautiful beaches and a lovely languid feel, where ox carts are still a preferred mode of transport. If you’re interested in conservation, Fregate is the island for you with its luxury eco-lodge. Not all the islands have accommodation, but are still worth visiting by boat or flying over in a helicopter. For true luxury, try North Island, with its boutique, bespoke feel and butlers waiting on you hand foot and finger. Visit Silhouette, or Bird Island, inhabited by three million Sooty Terns (May-Nov) and add Cousine into the mix. The islands’ accommodation varies with very different vibes, there’s something for everyone from intimate hideaways to beach bungalows to luxury 5 star cabanas. Why not try a few different islands to ring the changes – you can do three islands in a week and you won’t feel hurried.